We got three questions for this week’s mailbag. As always, use the widget on the side of the page to submit your questions. Bob writes: I’ll miss Zucc, one of the smartest players I’ve seen since 1951. Ok not really a question, but yes we can all agree with you Bob. 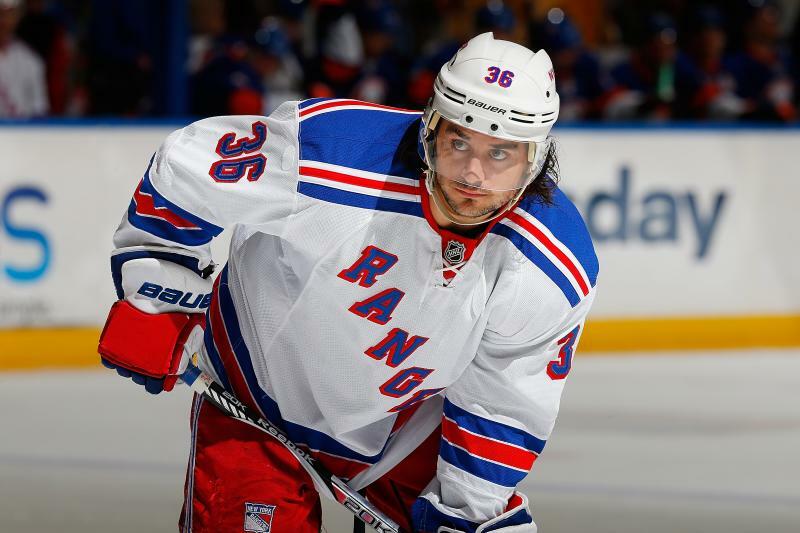 Mats Zuccarello was a rare hockey player for the Rangers. He was the only player on the roster that had a unanimous love among the fans. I can’t think of one person who disliked him. Didn’t matter if you’re an eye test person, a stats person, a blue collar hockey person, or a white collar hockey person. You loved Zucc. He will be missed. Tommy Hockey asks: Do you think the conditional 3rd (1st if Zucc re-signs in Dallas) is a poison pill to prevent Dallas from re-signing Zucc? Is it opening a path back to New York? This was submitted before Zucc broke his arm in his Dallas debut, but I’m going to answer from the point of view of when the trade was made, not after he broke his arm. I think it can be viewed as a way to ensure that Dallas does not re-sign Zucc, however I’m unsure if that truly means it’s a trade and re-sign for the Rangers. Getting a 2nd and a 3rd and then re-signing Zucc would be brilliant, but it is heavily contract dependent. In the end though, I don’t think that’s going to happen. The best case scenario is that Zucc heals for the playoffs (and Dallas makes the playoffs). The Stars get a lucky draw, upset a team or two, and Zucc plays a major role in them advancing to the Western Conference Final (thus triggering one condition, turning the 2019 2nd into a 1st). If he plays an integral role, Dallas, who is losing top-six forwards this offseason, would then re-sign him, making that 2020 3rd into a 1st. It’s a pipe dream, for sure. Mikeyyy asks: Who are your top-five prospects? What are their ceilings? For the sake of this list, Filip Chytil and Tony DeAngelo have graduated from “prospect” status because they’ve played 50 NHL games. Vitali Kravtsov – this kid is going to light it up for the Rangers when he comes over, and it may be as soon as next season. I have him projected as a top line winger. Igor Shestyorkin – the heir apparent also might come over this summer. If Henrik Lundqvist is The King, then Shesty is The Czar. His numbers in the KHL are borderline insane. Between he and Kravtsov, the Rangers have potentially elite talent coming over. K’Andre Miller – speaking of potentially elite talent, Miller is having a fantastic season at Wisconsin. The kid is big, fast, skilled, and learning the defense position quickly (he’s a convert from forward). He’s a bit more volatile when it comes to projections though. He could be a top pairing guy, but could be more of a strong 2nd pairing guy if he struggles in his own zone. Lias Andersson – I still like this kid, and he’s found his defensive game since his recent call up. The kid is just 20 years old, and he will find his offensive game. He’s probably going to be a solid middle-six option. If the Rangers are going to truly compete, Andersson is your 3C. But if everything goes right, he could be a 2C. Yegor Rykov – I’m going off the board here for my #5, but that’s probably because I haven’t heard much about Nils Lundkvist. Rykov has had a solid season in the KHL and may make it a trio coming over this summer. He’s been overlooked because of Miller and Lundkvist, but he looks to be solid middle pairing potential. "Mailbag: Zuccarello, Dallas pick conditions, prospects", 5 out of 5 based on 10 ratings. I love your selection of our top 5 prospects, especially the trio from Mother Russia. Everything I’ve read about “The Czar” is outstanding, what a replacement for Hank down the road. Vitali Kravtsov, looked great at the 20 and unders , playing center because there was a need, and he showed flexibility, and hockey IQ. I fell in love with Miller the day we drafted him, he is going to make his mom proud. Rykov is someone I’m looking forward to seeing play, he is solid, or so they say, and has size. Maybe we can rid ourselves of some of the smurfs. Lias will be a very good player, he has the heart of a lion, and the determination as well. Bottom line folks, we are going to love this rebuild real soon!!!!!!!!!!!! I will reserve Judgement on Rykov until Traverse City. Lots of love has been thrown around on eastern bloc D who wind up stinking the joint out on the smaller ice. oops. “the Czar”, of course. What would be the earliest we see Miller? Any injury update in Miller? I’ve been checking the Wisconsin box scores & he’s not playing yet. He is said to be fine, just a scare…..He won’t come up for at least another year, after his sophomore season. Tony Granado has nothing but great things to say about the kid, and he is making great strides learning his craft under a very good coach!!!!!!! Why d are you moderating this post????? El Gato is “The Cat” … just gave Emile a Latin handle… ? Bone bruise and Wisco ain’t going nowhere this season; better to shut him down rather than rush him back. The chances of Dallas winning 2 playoff rounds is slim to none. But if I was a betting man I would place my marker on Zuc signing a deal with Dallas. They have the cap space, Zuc is a player that compliments Segin and Benn. And lastly Texas State tax law gives Zucc an incentive to sign on the dotted line. Yep, that’s what I’m thinking as well … more likely he resigns with them than Dallas winning 2 rounds. I love Zuc more than I care to say, but does passing up on scoring chances influence hockey intellect? I love Andersson, but if he’s our 2C then the rebuild is on in earnest. And may take a while. I didn’t think having Hayes as their 2C made them a good team, no less Andersson. P.S. Good prospect list. I think Rykov and Lundkvist are pretty even. Andersson is the future captain of the Rangers. Mark my words. The Rangers do think of him in that way, yes. No sarcasm. He needs to thicken up a little (.muscle wise ) in the off season along with some skating lessons and he will fill the role a whole lot better. He has the smarts and will. That will all come, at some point. Lias is just getting comfortable on the ice now. Not sure about the thickening up part, he’s actually lost weight (think I heard 8-10 pounds) since he was last here and looks better on the ice because of it. Besides, weight is rarely an issue, strength is the key. Q1. you forgot about some people. I would second what richter wrote. Q2. it would be really odd for them to go through all the tears/drama only for “comeback zucc” night. also seems like the org and his camp went through a rift this year. Q3. based on this list, the rebuild still has work to do, need a killer june. Good news on my prediction then, they are going to spend this offseason. Current core: Zib, Kreider, Chytil, Buch, Skjei, DeAngelo, Hank, Fast, Lemieux, Shatty (I think), Hajek, Lindgren, Vesey?, Nieves, Andersson, Howden. I don’t know about Strome. Coming next year: Krav, Shesty. Free agent possibilities: Panarin, Karlsson. Please no Karlsson, will be too expensive, and will want long term…………. These numbskulls would 100% sign Karlsson. They do. Not. Learn. That would be a Sather move, not Gorton! If the expansion draft is tomorrow (using their contract status in 2021: so Hank is UFA; Lias, Chytil, Hajek, Day all RFA so ineligible) who’s your 7-3-1(8-1)? That’s the only prism one should be looking though. A: do I want to win with that group? B: how do I win before the expansion draft while still protecting/ improving that group? C: how do I lock my group in after the expansion draft? You’re possibly talking about a prohibitive price for Trouba in a trade. In a vacuum he’s a great fit here. I was thinking about a poison pill contract since he’s an upcoming RFA. But that price would be too high also. It might be best to wait until UFA status. Cause for the life of me I cannot come up with a trade scenario that doesn’t include #1 draft picks, Kreider, and one or two of last years group of Miller, Kravtsov and Nils, all discussed in whatever combination. So, in other words, I just don’t see it, he’s not the missing link of a SC final team right now in this rebuild. We can wait a year longer IMO. To all, I think this is what they are going to do, don’t kill the messenger.